Dairy sheep milking is an emerging industry in New Zealand, but at present there is no national breeding scheme. A prototype model for the genetic evaluation of dairy sheep was developed. Data were obtained from a flock of 123 crossbred ewes, over 479 monthly flock tests during the season 2015/16. Breeding values were estimated for lactation yields of milk, fat, protein and lac-tose, and for live weight, somatic cell score, first let-down time and yield, and number of lambs born, from a multiple-trait animal model. Heritabilities and phenotypic and genetic correlations required for the model were obtained from the literature, and pheno-typic standard deviations were obtained from the data set. 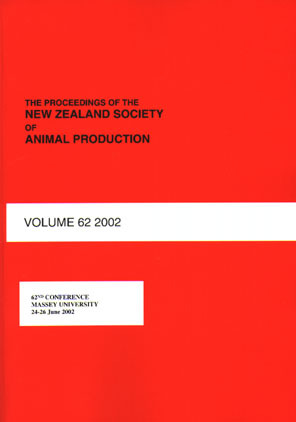 This prototype model to obtain estimated breeding values of animals in this flock can be extended to other dairy sheep farmers, to create selection schemes at industry level and start a systematic breeding program for the emerging New Zealand dairy sheep industry.